Welcome to an interview with Dianne Lynn Gardner, a fantastic author and artist, as well as one very busy and incredibly awesome lady! Today’s interview is part of her blog tour for the re-release of her book, Dragon Shield, the second book of her Ian’s Realm Saga. This re-release comes with a facelift and a new short story among other surprises. And to accompany this interview, Dianne’s provided a great excerpt to get us started on the next part of Ian’s journey. Will you tell us a bit about Dragon Shield and what inspired you to write it? 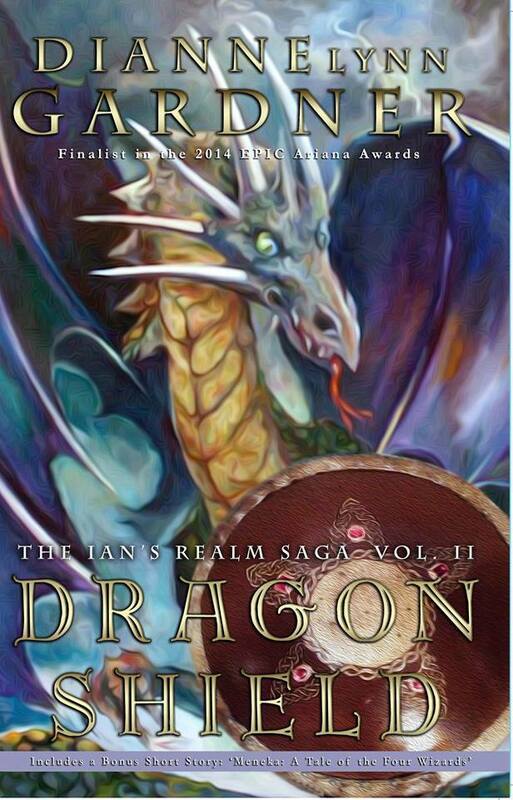 Dragon Shield is the second book in the Ian’s Realm Saga. It was actually the first book I drafted, but once the story was written I had so many questions from my beta readers I knew I needed to write a prequel, hence Deception Peak. By the time the first book was written, so much had changed that Dragon Shield was almost entirely revamped aside from the characters, the plot and the theme. I began the Ian’s Realm Sage to satisfy a need for my grandchildren. I have 9 grandsons and whereas my granddaughters were always reading, the boys were not. I asked them what kind of books they’d like, if they’d like a story about a dragon, and they were excited to be part of the conceptual process. While I painted a 9 ft 3 panel dragon painting, the story evolved. Can we look forward to seeing more of Abbi and Ian’s father? Yes. 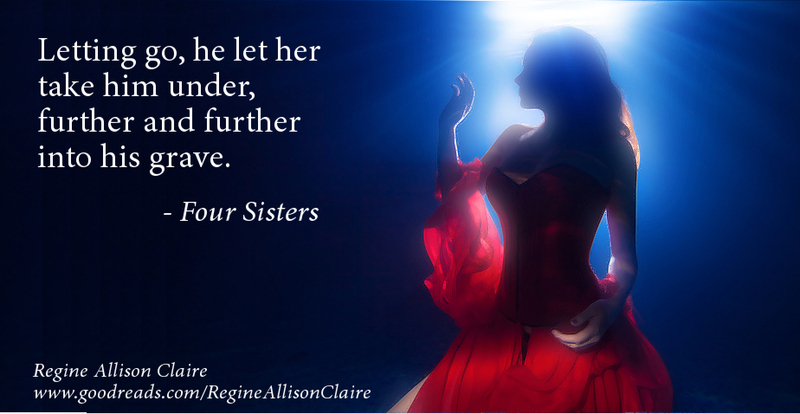 The next story is Rubies and Robbers and concludes the trilogy. Book IV is titled Diary of a Conjurer. 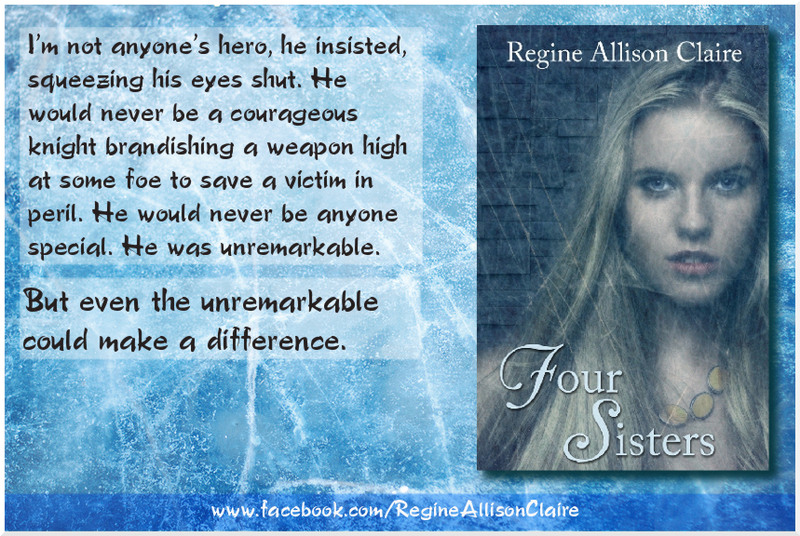 That book weaves A Tale of the Four Wizards series into the Realm Saga. Book V is Cassandra’s Castle, and we have a couple of cameo appearances in that one. I’m still working on book VI, Abbott, which in the timeline comes somewhere after Diary but before Cassandra. I plan on doing a book VII but it hasn’t been outlined yet. In Deception Peak, Ian learned some tough lessons and it’s one of the things I loved most – the “tough love” approach. Should we expect more from this second installment? Most definitely, even more so in fact. The closer Ian comes to manhood, the tougher it is on him. He has some pretty hefty lessons to learn. What are your favourite things about Ian? What makes him dear to your heart? He’s so much like my grandsons. Life isn’t easy even for good people, and we all have flaws in our character. I think growing up, making that transition between child an adult, is the toughest thing people go through. Ian struggles to be a man when he’s still a child. He wants to make the right decisions and yet he stumbles not knowing how. I remember how awkward my coming of age experience was and all the mistakes I made. I feel for him. Other than Ian, do you have a favourite character in Deception Peak? Amleth. He was fashioned after someone I know, and I combined his traits with of the honor and just temperament of Native Americans I’ve met. Are there any lines from Dragon Shield that stick out in your mind – any favourites, perhaps? Yes. Aren is the one that says it to Ian. The words cut our hero like a knife. His indecisions and lack of backbone revealed him in a less than desirable light in the eyes of the Kaemperns. What is the main message(s) you’d like young readers (and older!) to take from Dragon Shield? I love the way Shelia Deeth put it in one of her reviews. I’d like to quote if you don’t mind. 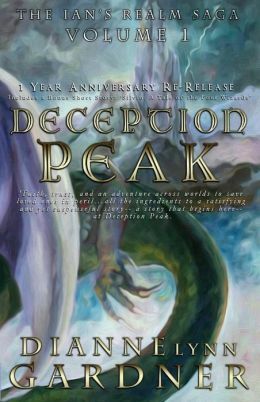 The re-released editions of Deception Peak and Dragon Shield have short stories about four young wizards. First was Silvio’s story and now, Meneka’s. What inspired you to write these stories? There’s much more to the Realm than what Ian is seeing in his short time there. There’s legend, and these short stories introduce us to the magic, and conflict that is stirring in the Realm. They are doors to future books as well, and some of them hold little nuggets bout Ian’s story that you wouldn’t see otherwise. I am really glad we’re including them with the novels this time. I’d like everyone to have the chance to read them. Speaking of inspiration …what inspired you to write YA fiction and what is it that keeps you coming back? I love teens. I absolutely love them. I feel they are underrated and misunderstood. Like I said, growing up for me had been harder than any other part of life, and more so because of inner conflict. I’m hoping to shine a light in those dark places for young people. And finally, a really fun question! If you were to write yourself into the story, where would you be and what would you be doing? “Integrity isn’t something you do, it’s who you are,” Aren tells the confused Ian in The Dragon Shield. Now a young man, Ian returns to the magical Realm to fight against the tyranny that has befallen his friends. But the Realm is a different place, the forest is dying, the Kaemperns have lost the shield that protected them from the dragon, and Ian has a hard time proving his allegiance when trouble follows him through the portal. His struggle to do right buries him in confusion, and he must fight his own will to prove his integrity. The Ian’s Realm Saga is filled with sorcery, wizards, magic, and fantasy adventure, great for young readers and the entire family. Watch this award-winning trailer on Youtube. 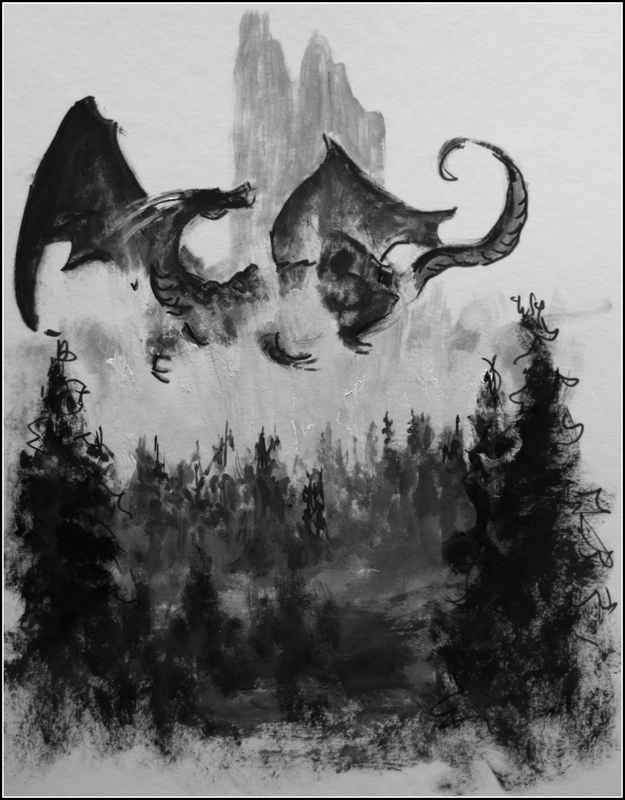 Purchase a copy of Dragon Shield today over at Amazon! The man didn’t speak, but Ian recognized the clothing and the men’s complexion as that of the Northern tribe. He eyed Brad burying his head in the sheepskin. I guess we do look pretty suspicious, if not pathetic. Their eyes grew wide, their faces paled and they exchanged glances. The men proceeded to unarm him. They took his bow off his shoulder and his quiver from his back. “There’s not a bow around here that looks like that. Amleth will know where it comes from.” Ian watched with remorse as they gathered his things in their arms. But when they unfastened his armor from around his chest, it was all he could do to hold back his rage. “This is my Dad’s armor,” he protested. They said nothing as they unfastened the leather ties and pulled the metal chest guard away. He wanted to lash out at them but held back. If he were going to be accepted, he had to remain calm. This was a test, that’s all. They were testing to see if he was a friend. Everything will be resolved when I talk to Amleth. With the weaponry in hand, one of his captors knelt over and picked up the shield that lay by Brad’s bed. “Hey,” Bran protested and jumped to his feet. “Brad.” Ian said. His eyes stopped the boy. Ian shook his head. The man who held the shield asked. “What’s this?” After inspecting the shield, his comrade turned to Ian. The men stepped out of the yurt with Ian and Brad’s belongings. When their footsteps could no longer be heard, Brad sat up. Brad just squinted like he didn’t know what Ian was talking about. More about Dianne, Ian’s Realm and her other works! The Pacific Northwest is my home. After living in the dry desert of Arizona for over 23 years, I tired of always praying for rain, so I decided to come and get it on my own. Gray skies and deep forests give way to the most glorious summers you could ever imagine. Not to mention the abundance of berries, clams, oysters, salmon, fruits of all kinds, to me the Puget Sound area of Washington is the richest place in the world. I have seven children, all grown. Sixteen grandchildren that need stories written, and so they are my inspiration. People always find it fascinating that I lived in a mud house for over 13 years, hauling water from the well in a bucket, cooking on a wood stove, planting blue corn in desert washes, and generally living out of the box. Some of these experiences are tapped into my novels. My website is http://gardnersart.com You’ll find books, audios, artwork and how our movie production is coming along on that site. 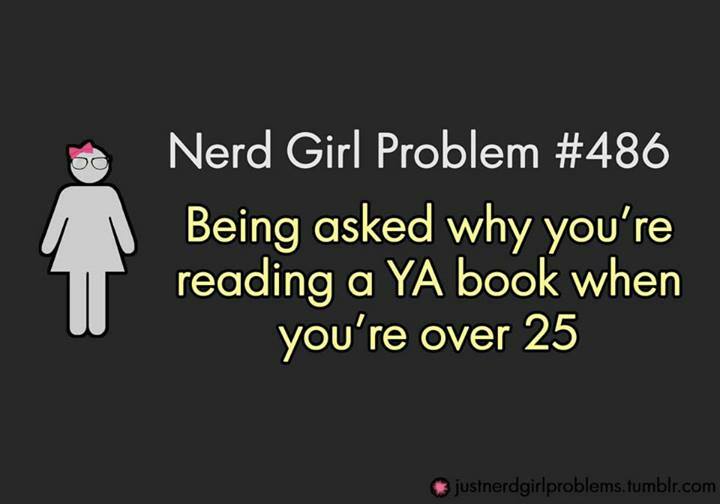 Categories: Interviews, Novels, YA Fantasy, Young Adult Literature | Tags: Dianne Lynn Gardner, Fantasy, Ian's Realm Saga, Interview, novel, series, YA literature, young adult | Permalink.